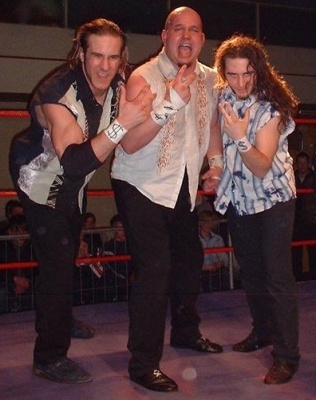 - CHIKARA Tag World Grand Prix '03 (July 5) = Swiss Money Holding (Ares & Claudio Castagnoli) defeated The Senior Assault Team, then fought to a 30-Minute Draw with The SuperFriends (Chris Hero & Mike Quackenbush). - CHIKARA Naked (March 31, '06) = Ares won the wXw Heavyweight Title, taking down Mike Quackenbush. - PWG European Vacation II: Germany (October 28, '07) = Ares retained the wXw Heavyweight Title, beating Joey Ryan. - CHIKARA A Touch Of Class (January 31, '10) = The BDK (Swiss Money Holding [Ares & Claudio Castagnoli], Lince Dorado, & Tursas) defeated Eddie Kingston, Mike Quackenbush, Equinox, & Jigsaw. 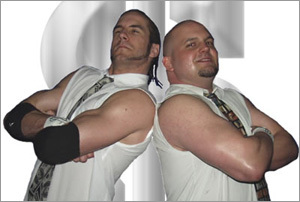 - CHIKARA The Mint Condition (February 27, '10) = The BDK (Swiss Money Holding) beat The Throwbacks. - CHIKARA A World Of Comforting Illusions (February 28, '10) = The BDK (Swiss Money Holding) won a "Four Way Tag-Team Elimination" Match over The Badd Boys, The Osirian Portal, and The Super Smash Brothers. - CHIKARA Wit, Verve, And A Bit o' Nerve (March 20, '10) = The BDK (Swiss Money Holding) won the CHIKARA Campeonatos de Parejas Titles, defeating The Colony (Fire Ant & Soldier Ant). - CHIKARA Dead Men Don't Laugh (March 21, '10) = The BDK (Swiss Money Holding & Tursas) won over Mike Quackenbush & Incoherence. - CHIKARA King of Trios '10, Night One (April 23) = The BDK (Swiss Money Holding & Tursas) took down Sara Del Ray & The Osirian Portal in the opening round of the King of Trios '10 Tournament. - CHIKARA King of Trios '10, Night Two (April 24) = The BDK (Swiss Money Holding & Tursas) beat Team Perros del Mal (El Alebrije, Cuije, & El Oriental) in the Quarter-Finals of the King of Trios '10 Tournament. - CHIKARA King of Trios '10, Night Three (April 25) = The BDK (Swiss Money Holding & Tursas) defeated Team Big Japan Wrestling (Kankuro Hoshino, Yuji Okabayashi, & Daisuke Sekimoto) and The Colony (Fire Ant, Green Ant, & Soldier Ant) to win the King of Trios '10 Tournament. - CHIKARA Aniversario Zehn (May 22, '10) = Ares took down UltraMantis Black. - CHIKARA Aniversario Elf (May 23, '10) = The BDK (Swiss Money Holding) retained the CHIKARA Campeonatos de Parejas Titles, winning a "Three Falls" Match over Incoherence. - CHIKARA We Must Eat Michigan's Brains (June 26, '10) = The BDK (Swiss Money Holding & Tursas) fell to Da Soul Touchaz. - CHIKARA Faded Scars And Lines (June 27, '10) = The BDK (Swiss Money Holding) stayed the CHIKARA Campeonatos de Parejas Champions, winning a "Three Falls" Match over The Future Is Now (Equinox & Helios). - CHIKARA Chikarasaurus Rex: King Of Show (July 25, '10) = The BDK (Swiss Money Holding) beat Tommy Dreamer & Eddie Kingston. - CHIKARA Eye To Eye (September 18, '10) = The BDK (Swiss Money Holding) kept the CHIKARA Campeonatos de Parejas Titles, winning a "Three Falls" Match over 3.0. - CHIKARA Through Savage Progress Cuts The Jungle Line (September 19, '10) = Ares defeated Eddie Kingston. - CHIKARA The Dark Cibernetico (October 23, '10) = Ares competed in the "Torneo Cibernetico" Match, which was won by Eddie Kingston. - CHIKARA Terror In The Neighborhood (October 24, '10) = The BDK (Swiss Money Holding) retained the CHIKARA Campeonatos de Parejas Titles, winning a "Three Falls" Match over The Osirian Portal. - CHIKARA Scornucopia (November 20, '10) = The BDK (Ares, Daizee Haze, Pink Ant, & Tursas) fell to Sugar Dunkerton & Da Soul Touchaz. - CHIKARA The Germans (November 21, '10) = Ares won a "Falls Count Anywhere" Match over UltraMantis Black. - CHIKARA Reality Is Relative (December 12, '10) = The BDK (Swiss Money Holding) lost the CHIKARA Campeonatos de Parejas Titles, losing a "Three Falls" Match to Mike Quackenbush & Jigsaw. - CHIKARA Chaos In The Sea Of Lost Souls (January 23, '11) = The BDK (Swiss Money Holding, Tim Donst, & Delirious) were beaten by Mike Quackenbush, Jigsaw, & The Colony (Fire Ant & Soldier Ant). - CHIKARA Aniversario & His Amazing Friends (May 21, '11) = The BDK (Ares, Jakob Hammermeier, Daizee Haze, & Pinkie Sanchez) lost to Madison Eagles & The Colony (Fire Ant, Green Ant, & Soldier Ant). - CHIKARA Aniversario: The Legendary Super Powers Show (May 22, '11) = The BDK (Swiss Money Holding) defeated 3.0. - CHIKARA Odyssey Of The Twelfth Talisman (September 17, '11) = Ares fell to Sara Del Ray. - CHIKARA Martyr Yourself To Caution (September 18, '11) = Ares took down Marshe Rockett. - CHIKARA Cibernetico: The Animated Series (November 12, '11) = Ares competed in a "Torneo Cibernetico" Match, which was won by Sara Del Ray. - CHIKARA High Noon (November 13, '11) = The BDK (Ares & Tim Donst) lost an "Eye of Tyr/Hair" Match to The Spectral Envoy (UltraMantis Black & Hallowicked).